(1) Transthoracic echocardiography is indicated for baseline evaluation of LV size and function, RV and left atrial size, pulmonary artery pressure, and severity of MR (Table 4) in any patient suspected of having MR.
(2) Transthoracic echocardiography is indicated for delineation of the mechanism of MR.
(3) Transthoracic echocardiography is indicated for annual or semiannual surveillance of LV function (estimated by ejection fraction and end-systolic dimension) in asymptomatic patients with moderate to severe MR.
(4) Transthoracic echocardiography is indicated in patients with MR to evaluate the MV apparatus and LV function after a change in signs or symptoms. (5) Transthoracic echocardiography is indicated to evaluate LV size and function and MV hemodynamics in the initial evaluation after MV replacement or MV repair. (1) Exercise Doppler echocardiography is reasonable in asymptomatic patients with severe MR to assess exercise tolerance and the effects of exercise on pulmonary artery pressure and MR severity. (1) Transthoracic echocardiography is not indicated for routine follow-up evaluation of asymptomatic patients with mild MR and normal LV size and systolic function. (1) Preoperative or intraoperative transesophageal echocardiography is indicated to establish the anatomic basis for severe MR in patients in whom surgery is recommended to assess feasibility of repair and to guide repair. 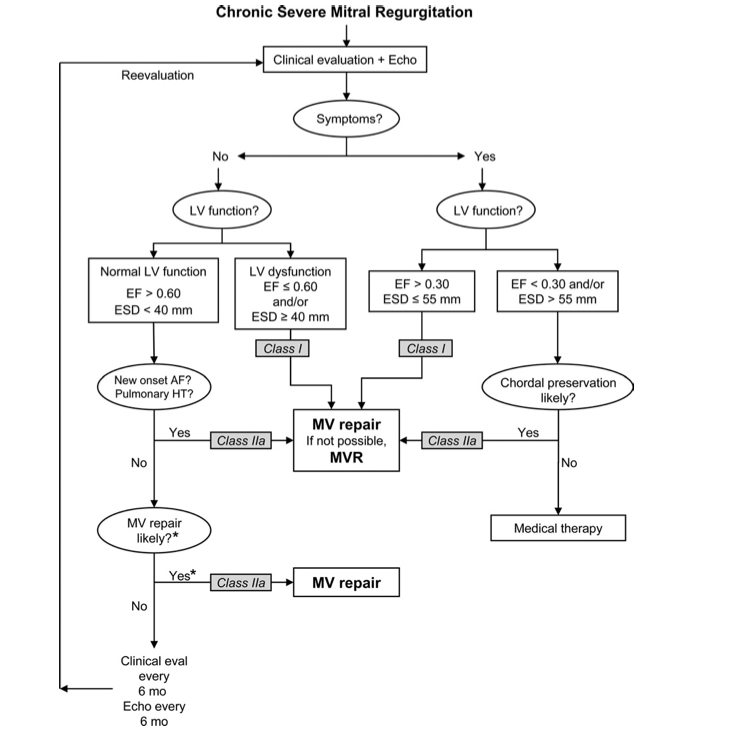 (2) Transesophageal echocardiography is indicated for evaluation of MR patients in whom transthoracic echocardiography provides non-diagnostic information regarding severity of MR, mechanism of MR, and/or status of LV function. (1) Preoperative transesophageal echocardiography is reasonable in asymptomatic patients with severe MR who are considered for surgery to assess feasibility of repair. (1) Transesophageal echocardiography is not indicated for routine follow-up or surveillance of asymptomatic patients with native valve MR.
(1) Left ventriculography and hemodynamic measurements are indicated when noninvasive tests are inconclusive regarding severity of MR, LV function, or the need for surgery. (2) Hemodynamic measurements are indicated when pulmonary artery pressure is out of proportion to the severity of MR as assessed by noninvasive testing. (3) Left ventriculography and hemodynamic measurements are indicated when there is a discrepancy between clinical and noninvasive findings regarding severity of MR.
(4) Coronary angiography is indicated before MV repair or MV replacement in patients at risk for CAD. (1) Left ventriculography and hemodynamic measurements are not indicated in patients with MR in whom valve surgery is not contemplated. (1) MV surgery is recommended for the symptomatic patient with acute severe MR.
(2) MV surgery is beneficial for patients with chronic severe MR* and NYHA functional class II, III, or IV symptoms in the absence of severe LV dysfunction (severe LV dysfunction is defined as ejection fraction less than 0.30) and/or end-systolic dimension greater than 55 mm. (3) MV surgery is beneficial for asymptomatic patients with chronic severe MR* and mild to moderate LV dysfunction, ejection fraction 0.30 to 0.60, and/or end-systolic dimension greater than or equal to 40 mm. (4) MV repair is recommended over MV replacement in the majority of patients with severe chronic MR* who require surgery, and patients should be referred to surgical centers experienced in MV repair. (1) MV repair is reasonable in experienced surgical centers for asymptomatic patients with chronic severe MR* with preserved LV function (ejection fraction greater than 0.60 and end-systolic dimension less than 40 mm) in whom the likelihood of successful repair without residual MR is greater than 90%. (2) MV surgery is reasonable for asymptomatic patients with chronic severe MR,* preserved LV function, and new onset of atrial fibrillation. (3) MV surgery is reasonable for asymptomatic patients with chronic severe MR,* preserved LV function, and pulmonary hypertension (pulmonary artery systolic pressure greater than 50 mm Hg at rest or greater than 60 mm Hg with exercise). (4) MV surgery is reasonable for patients with chronic severe MR* due to a primary abnormality of the mitral apparatus and NYHA functional class III–IV symptoms and severe LV dysfunction (ejection fraction less than 0.30 and/or end-systolic dimension greater than 55 mm) in whom MV repair is highly likely. (1) MV repair may be considered for patients with chronic severe secondary MR* due to severe LV dysfunction (ejection fraction less than 0.30) who have persistent NYHA functional class III–IV symptoms despite optimal therapy for heart failure, including biventricular pacing. (1) MV surgery is not indicated for asymptomatic patients with MR and preserved LV function (ejection fraction greater than 0.60 and end-systolic dimension less than 40 mm) in whom significant doubt about the feasibility of repair exists. (2) Isolated MV surgery is not indicated for patients with mild or moderate MR.